Simon Says Food and/or Drink! This week the challenge is Food and/or Drink! I love to create my own background. 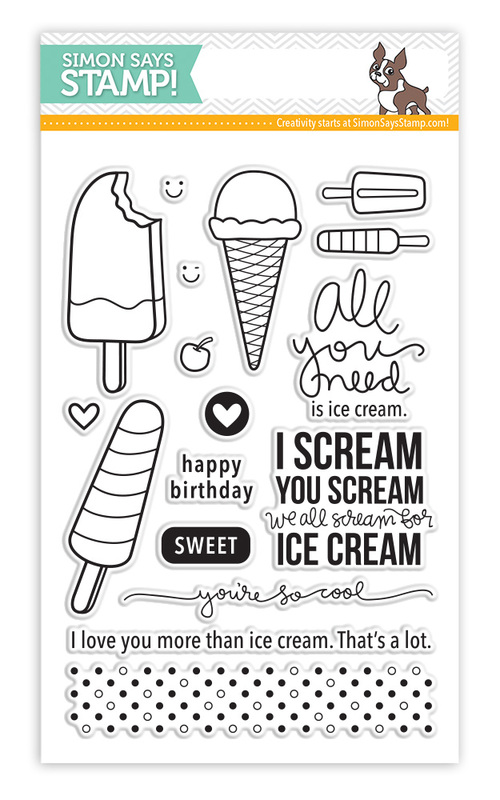 For this card, I have used the ice cream images from Ice Cream Dream stamp set from Simon Says Stamp. I stamped them randomly with versamark and white heat embossed the images on watercolour cardstock. To colour the images, I used Zig Clean Brush pens. For the background, I used a grey colour around the outer images and then washed it out using an aquabrush. 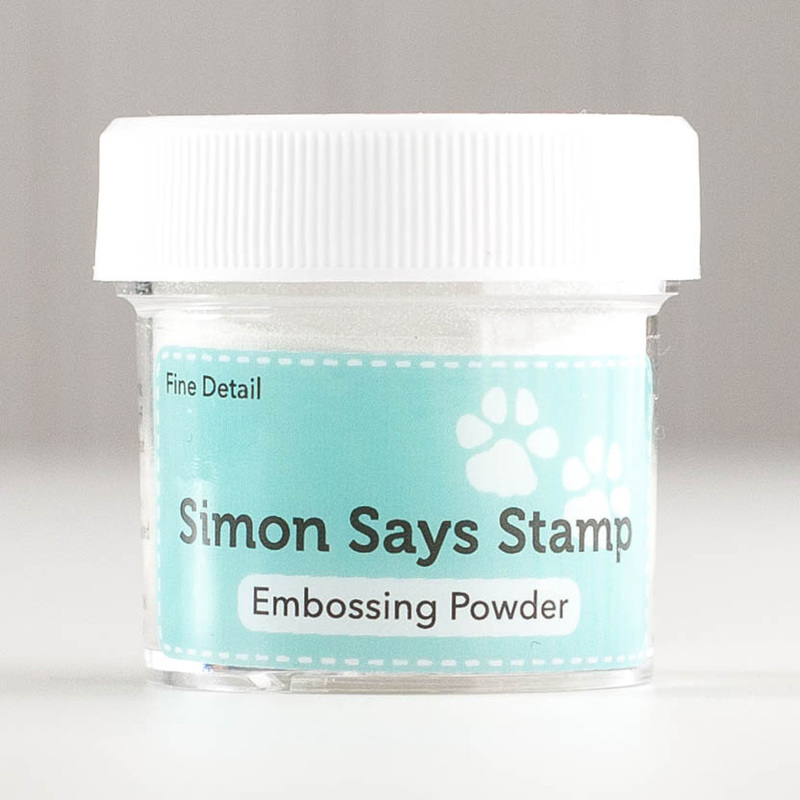 For the sentiment, I die cut a few of the Enjoy die from Simon Says Stamp with black cardstock. I then stacked and glued them for added dimension. 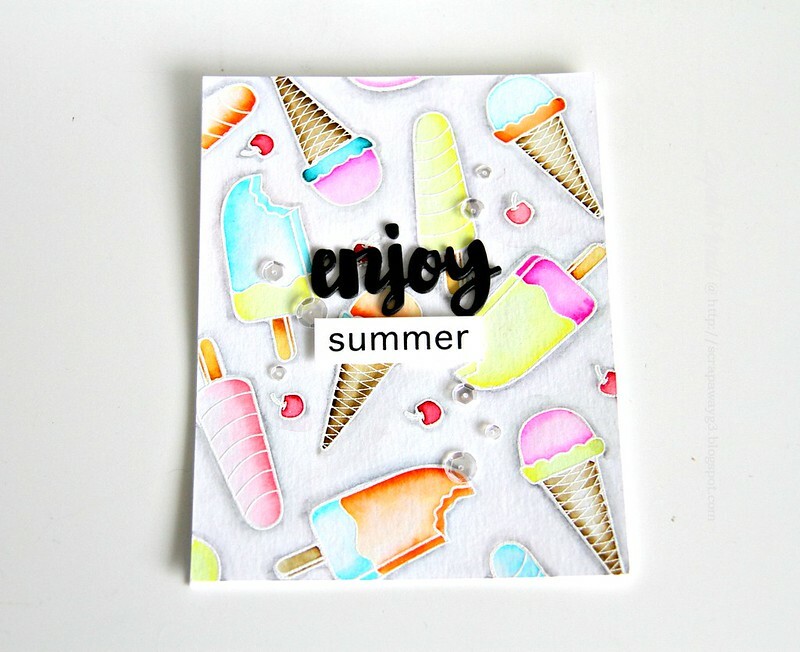 For the smaller sentiment, I simply stamped the word summer from Pool Play stamp set in a strip of white card stock. This card needs those gorgeous Sparkly Clear sequins from Pretty Pink Posh. I absolutely LOVE this! Beautiful watercoloring! 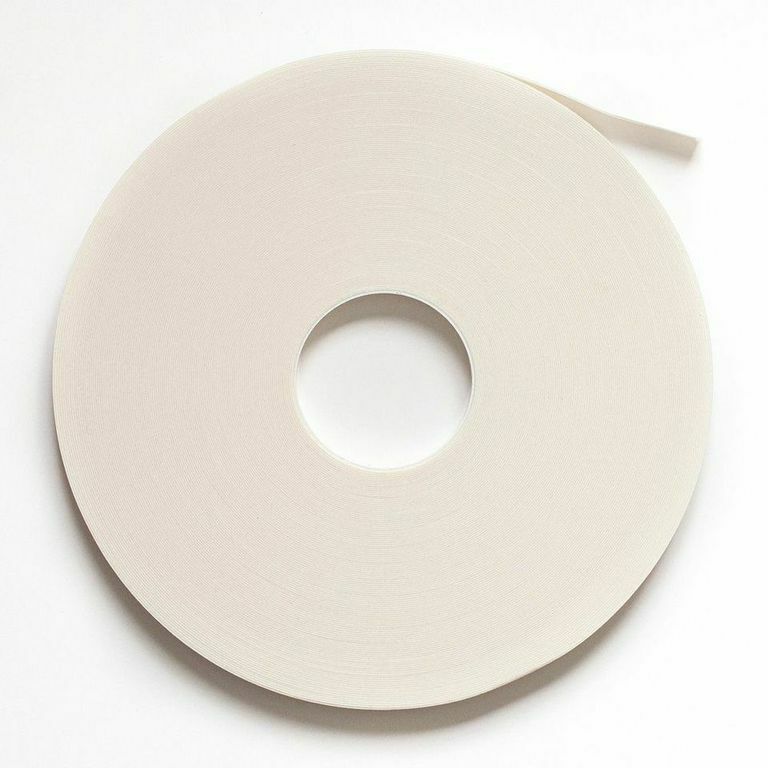 Love your soft colors, Gayatri – they make me feel cooler just looking at them! IM altas in love with your cards. Great job! Beautiful card Gayatri!! Love it!! Beautiful colors!! A fabulous card Gayatri, your stamped and colour background with images are stunning with lovely e=sequins and super sentiment!! Gotta agree with everyone else, you did a stellar job on this card, especially your coloring. Beautiful, and oh, so tempting! Super fun card and colors! Amazing card, love your fabulous background. Super sweet card Gayatri! Your coloring is fabulous!! Goodness, this card just jumps off the page. Striking does not begin to describe it. Your coloring is just so beautiful. Had to come over from Simon to tell you how much I admire the card. Lovely work! 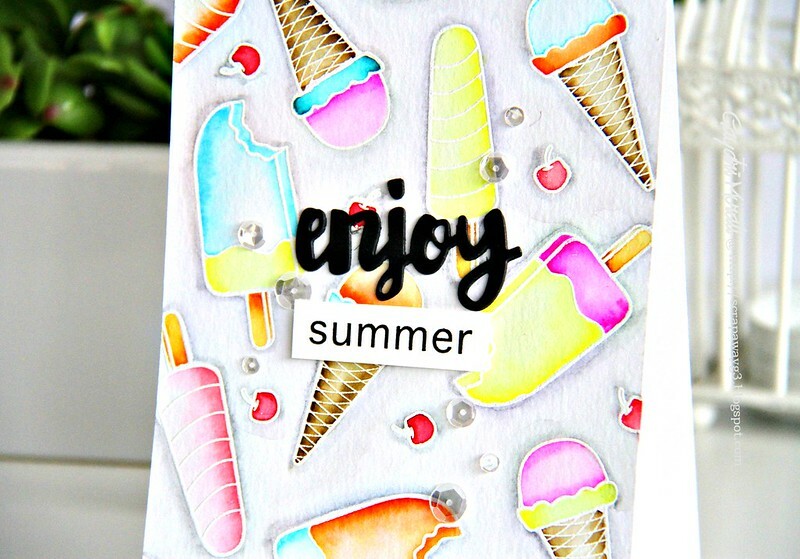 Very summery with the colors and the watercolor (both are gorgeous!) I love that you've created the background with all those frozen treats, too! What a wonderful design! Thanks so much for sharing! 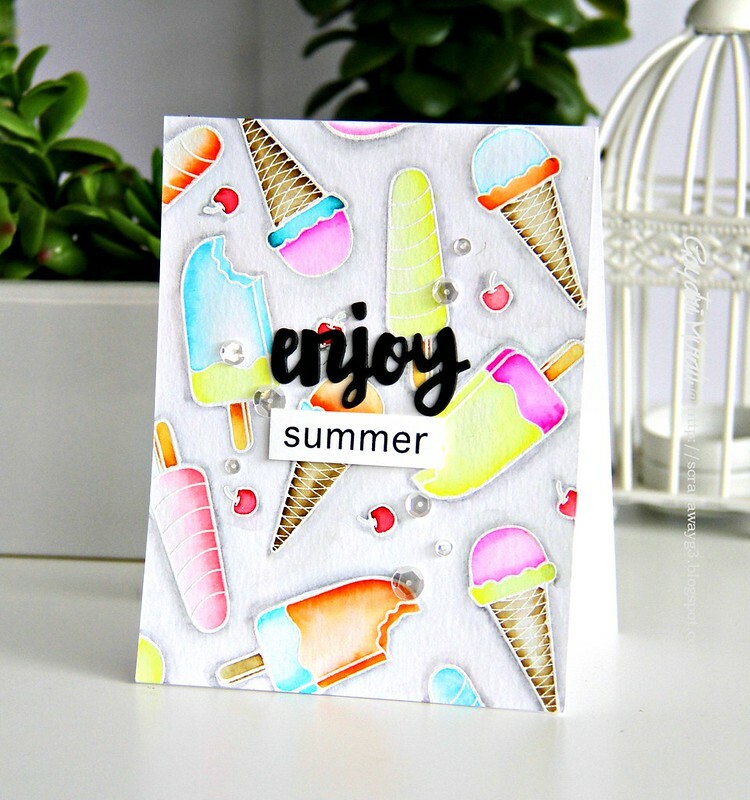 You captured the feel of summer with all those scrumptious looking frozen treats and the fabulous colors. Blessings! Gorgeous card! Such beautiful colours!